Two more Fox in Flats Darecember outfits! I'm participating in the style challenge each day on instagram, and blogging the outfits I manage to get photos of. The style challenge for the day was "orange kisses". I was thinking of doing orange accessories, until I remembered this tee in my wardrobe. The neon orange seemed like the best fit - as I don't own any orange lippy. I only have one lipstick actually, the same shade I wore to my wedding, just a really simple natural colour. I'm not a big lipstick fan. Nice jeans and a tee outfit for a bit of Christmas shopping. No necklace, as I felt the tee was attention grabbing enough. Hopefully no one looked too closely at what I was wearing though, as I realised at the end of the day when I got undressed that there was a big broccoli stain on the tee from baby T's breakfast! I hadn't looked in a mirror after he'd eaten. Nobody said anything so maybe I got away with it ;) I had thought I was clever getting up, dressed and taking outfit pictures before baby had even woken up too. Pyjamas are a much safer option for breakfast with baby! Last worn: leopard print tee, skinny jeans, Havaianas. I rediscovered this top during one of my wardrobe clean outs in pregnancy, and I'm so glad I did. It was my old favourite for a while, and it makes me smile every time I wear it. The style challenge for the day was "gold", which is such an easy one! I had a few outfit options to chose from. I really wanted to wear my metallic skinny jeans, they would have been perfect for this! But it was so hot and humid I decided on gold accessories instead. The skirt and sandals were worn together previously too! The shoes will be worn a bit over summer, as they are a slightly dressier option than my usual default of my Havaianas thongs. Last worn: Ray-Ban Wayfarers, brown tank, colour block maxi skirt, leather sandals, LV Neverfull tote. Linking up with Fab Favourites, Casual Friday, Passion 4 Fashion, Modest Monday, Style to Inspire, Let It Shine today. After reading your post, I think that its funny how we "re discover" items in our closet. I think what it actually means is that, well, we have too much ! Oh yes I definitely have too many things! I'm trying to reduce the size of my wardrobe, but not doing to well! that hail was terrifying! We got caught out in it, lucky no damage though, phew! You know that maxi skirt is one of my favorites! I love it paired with your brown floral tank. I can see why it makes you smile. haha yes! It happens to the best of us I think! 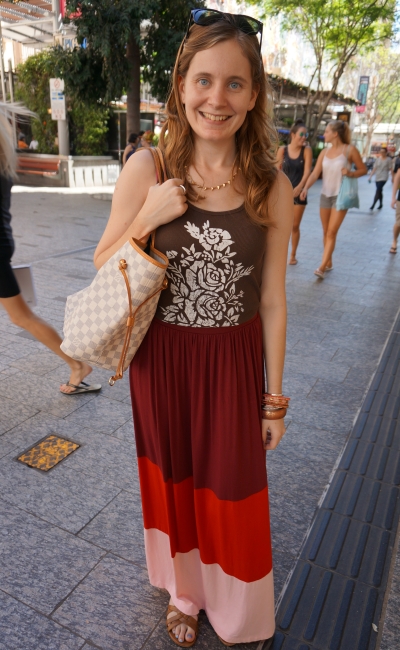 Love the pretty top you're wearing with your asos maxi skirt. Another couple of fab looks! i love that orange top Mica! both the color and print look great on you doll! That maxi skirt is always so gorgeous. You wear it well! Ahh you're so lucky it's summer where you are - that maxi skirt is so pretty!